I know it's 100 degrees in most places, but I am the girl that loves to curl up on the couch with a good throw in any condition. Are you? Throws are lovely to curl up with + they are a quick and easy way to add a little flair and warmth to a space. 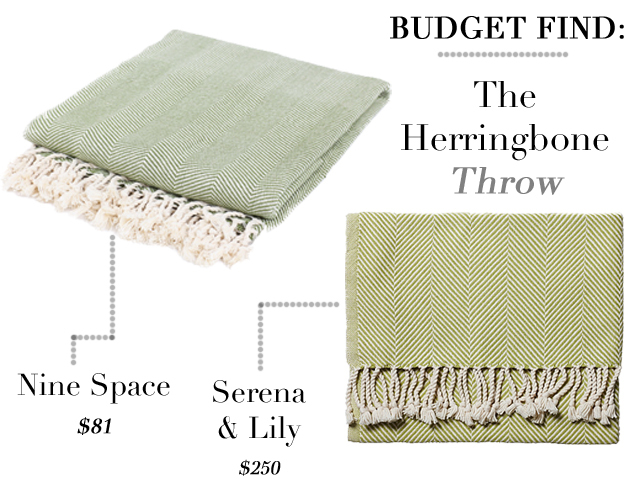 I love a good deal when I see one, so I had to tell you about this deal I found on the herringbone throw. I've seen these throws everywhere, so I just thought I would point this out to you in case you are in the market for a good throw! They both come in lots of different colors, too! I simply cannot watch tv without a throw! I think I've trained my body to expect it. What a great save you've found here, they look so similar! Those are the most perfect throws! I hope to have at least one huge one on my couch in my future cottage! I must get one of these ....... big time!! Great find indeed! I love a good throw to curl up with! Such a great find! So glad you shared this - I love the Serena throw...but it was way too pricey!